Thankfully the rain stayed away just long enough for Thursday evening’s welcome return of the Fairlands Valley Spartans Handicap 5k. There were 30 finishers. The winner was Linda Nolan, a massive 8½ minutes ahead of handicap in a personal best (PB) time of 27 minutes 29 seconds. Ryan Dunning finished first man in 23:50, just ahead of Ken Jude in a year best time of 23:25 and with newcomer Josh Massey third man in 23:53. Alexandra Whitehouse finished second lady (fifth overall) in a new PB time of 29:19, with Lauren Deighton third lady in a PB time of 23:50. Fastest runner on the night was Steve Green in 19:47, three seconds quicker than Stuart Haycroft 19:50, with Liam Herbert 20:08 third quickest. The fastest woman was Hannah Neale in a new PB of 22:32, with Lauren Deighton (23:50) second quickest and Susan McAneny 24:57 PB third fastest. There were also PBs for David Quicke, Mark Collins, Andy Reeve, Alice Burleigh, Emma Poulter and Julia White, a new Season Best time for Steve Gough and Year Bests for Vishal Shah, Lisa Gray, Bernadette Millwood, Simon Sypula, Jon Sypula, Andy Smith and Jordan Quicke. The time between the 2nd and 29th finishers was just 3 minutes 52 seconds and 73% of finishers were within 1 minute of their adjusted handicap. In handicap races the slowest runner starts first with the others at intervals based on their recent performances. In theory if everyone ran to form they would all finish together. In reality the winner will be the best improver. The next handicap 5K will be on Thursday evening 6th July. Fairlands Valley Spartans travelled to a wet and windy Cambridge University track for the second of four matches on Wednesday. The ladies team finished in second place, just three points behind Marshall Milton Keynes AC, but remain top of the league. The men’s team, depleted by other commitments, finished fourth. Dave Bowker started off the evening well by breaking the male over 50 year 1500 Metre Walk record by over 4 seconds in a good standard race. Chris Westcott returned from injury to race in the 1500 Metres coming second, then finishing third in the 200m. Anton McCalla covered the discus throw and the Triple Jump. Mark Freeman covered the men’s over 60 years events and a busy Steve Mayfield covered events in both the 35 to 49 and the 50 to 59 year age groups. The women’s over 50 years 4×200 Metres Relay team of Monica Brown, Sharon Crowley, Alison Wood and Tessa Stephenson lead from the start to finish off the evening with a record breaking win in an impressive time of 2 minutes 30.5 seconds beating their previous record time by three seconds. This was backed up by individual wins for Alison Wood, Monica Brown and Tessa Stephenson. Sharon Crowley did a personal best in the 1500 Metre Walk, beating her previous best by 29 seconds. Irish Hornsey finished third in the javelin and also the 200m. Yuko Gordon finished second in the 1500m. The women’s 35 to 49 years relay of Steph Mayfield, Christine Lathwell, Peta Wilson and Andrea Westcott won achieving maximum points. Peta Wilson also covered the 200m and discus events. Andrea Westcott did javelin, 80m hurdles, and equalled her personal best in the high jump to finish third. An injured Stephanie Mayfield bravely did the triple jump. Christine Lathwell covered two 1500m events, running one and walking the other. 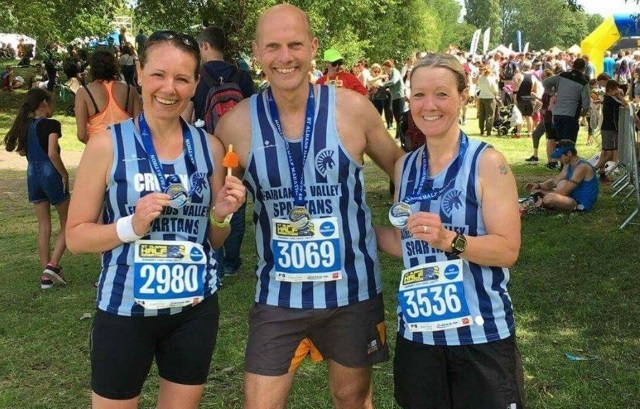 TIM ROBINSON, JULIE SHADBOLT, CAROLINE CROFT (pictured above), and KARTIK SHARMA ran the hot and very hilly St Albans Half Marathon on Sunday. Tim and Julie crossed the line together and were given finishing times of 2:13:27 and 2:13:28. Kartik was not far behind in 2:14:07 and Caroline clocked a time of 2:18:07. Seventy six Spartans raced in the second Mid Week League on 24th May when the club was also providing event organisers and marshals. Now Fairlands Valley are hoping that more than eighty will run this Wednesday evening’s event based on Preston near Hitchin (SG4 7RT). The marathon hugged the shoreline from the University of Manitowoc to the South, through Manitowoc and then Twin Rivers to the North, before turning back to a finish at the University. Always known to be a windy area, which is just as well, as it helped keep temperatures to the bearable, but at times they still approaching 28C or more. CRAIG HALSEY ran the open 3000 metres on the track at Watford in 9.26 on 31st May. At Stevenage parkrun Spartans filled three of the top ten finishers in the ladies’ division. CLAIRE PULLEN was first in 23:01, VERITY FISHER second in 24:24 and CAROL PAUL 6th in 26:08. TRACY PEZ ran her best time since injury, finishing in 26:46. ERICA GRAYSON ran 27:07 in her first parkrun, a 5K best time. KAREN ELLIS (27:53) and KAREN PALMER (28:45) were the other Spartan ladies. For the men BARRY OSBORNE was 8th in 20:58, ALLAN GARCIA was 19th in 22:26, a new course PB and RYAN DUNNING followed up his excellent run in the club’s handicap 5k with another fine run in 23:38. CALLUM BEASLEY in 25:24 was the third Spartan male finisher. TIM ROBINSON (27:24), JOHN MCCALL (27:59), JAMES SOUTH (29:51), SELVAN NAICKER (40:44) and IAN ALEXANDER (51:17, tail-runner) also ran. Fastest Spartan parkrunner of the week was TIM SABAN who returned to Canons Park and was 8th in 20:39, a new course PB. Finally, JOHN ROXBOROUGH ran into a top 50 finish at Conwy parkrun in 25:45. The fastest Spartan parkrunner of the weekend was CRAIG HALSEY, who ran a new course PB of 16 mins 41 secs at Panshanger to be first finisher, more than a minute and a half ahead of the second placed runner. CRAIG BACON was second Spartan finisher in 3th place in 22:57, also a new course PB, and KEN JUDE was next home in 23:51. ANDY JAY (25:00), TIM ROBINSON (27:35) and ANTHONY OSBORNE (38:09) completed the sextet of Spartans at the venue. Twenty-one Spartans turned out at the home parkrun in Stevenage. For the men NICK GILL was 16th finisher in 21:03, a new course PB. PAUL MAGUIRE was 39th in 22:38 (also a course PB) and DANIEL SUTTON 44th in 23:05. MARK BEASLEY also made the top 50 in 23:07. The other men running were RYAN DUNNING (23:27, course PB), SIMON SYPULA (26:55), JAMES SOUTH (30:39), STEVEN DOBNER (31:14), ROBERT HARDY (39:06) and SELVAN NAICKER (39:28). For the women HANNAH NEALE was second across the line in a new course PB time of 22:20. VERITY FISHER was fourth in 23:20, CALLIE CHAPMAN 12th in 25:46 and HAZEL SMITH 13th in 25:46. ALEXANDRA WHITEHOUSE (29:11) and SALLY PHILLIPS (29:47) also ran new course PBs to make the top 50. The other Spartan women were PAULINE FARNHAM (31:27, new course PB), EMMA POULTER (36:14), CAREN THAIN (36:15), EMMA MARTIN (39:52) and PAULINE HARDY (40:39). Elsewhere BARRY OSBORNE was 10th male finisher at Oak Hill in 20:19, while TIM SABAN was also in North London, running 22:14 to finish 5th at Oak Hill. Finally ANOUSAKA GREENWAY was first woman to finish at Worthing parkrun in a new course PB of 19:26.